One of my Foodie Journeys of Life, center purely on Fish Tacos. Mmm…Fish Tacos. Those delectable little pieces of fish, wrapped within a warm tortilla. What can be better? I love me some Fish Tacos. For me, I enjoy a Fish Taco full of grilled or blackened fish…topped with some fresh toppings…and wrapped in a nice flour tortilla. How delicious. I’m hungry just thinking about it. My most recent Fish Taco experience happened with no plan behind it. When a client visit resulted in lunch at a location with great Fish Tacos, I know what to do. I knew this would be a time that The Journey Continues. Bricktops is located within Waterside Shops in Naples. I had never visited before but, when the President of the company recommended Fish Tacos, I was ready to go. The Fish Tacos are served with blackened fish, guacamole and cheese…all wrapped in a flour tortilla. I ordered my Fish Tacos with the Sautéed Spinach as the side. While this is not my first choice for sides – I prefer rice & beans – I was happy to try some fresh spinach. 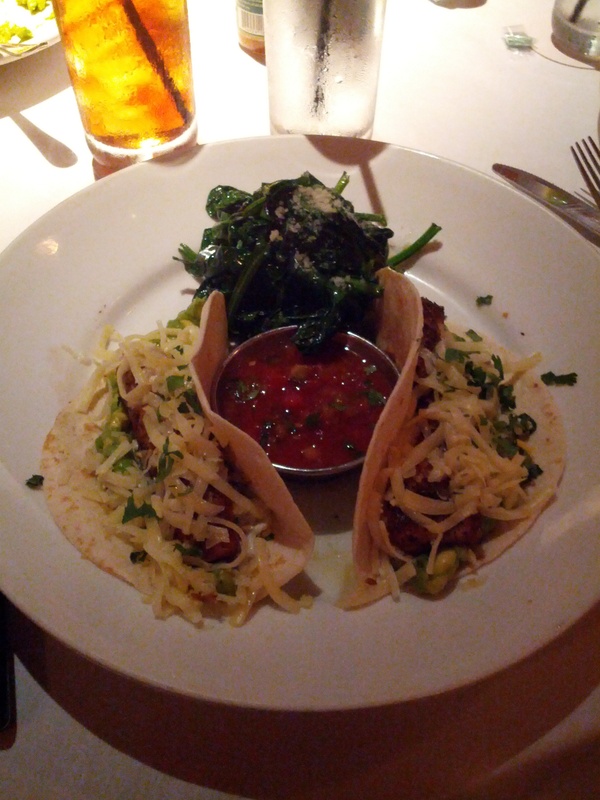 The Tacos arrived and I found two full tacos with a side of spinach. I picked up my first Fish Taco and found it to be pretty heavy in size. I added some salsa to the taco and dug in. The first thing I found was how great the guacamole and the fish blended together. The guacamole was really just smashed avocados but, the smoothly, creamy texture, paired with the slightly crispy exterior of the fish, was just divine. I believe the fish was grouper however, the flavor itself was not overwhelming. I found the cheese to be there but, besides adding an additional creamy feature, no real flavor came to be. I liked the salsa paired with the taco…it had just a hence of sweetness in it. As for the tortilla, it was a basic flour tortilla but, it was a good basic tortilla. It was fresh, served warm and held the contents of the taco together. I really enjoyed my first taco. I decided to eat all of my spinach before I started the second taco, as to enjoy each and every bite. The spinach was overly garlicy for my taste. But, I did enjoy the olive oil and parmesan cheese taste within it. I didn’t think it paired with the tacos at all. And, they put it on the same plate. Bad thing about this…the extra garlic and olive oil invaded the space of my tacos. After the spinach, I proceeded to eat and enjoy every bite of my taco…it was even better than the first one. Were these the best Fish Tacos that I have ever eaten? I don’t think so. But, they are definitely in the top 5. What really made these stand out were the smashed avocados mixed with the blackened fish…it was just so perfect. I think these would have been even better with queso blanco and a nice, homemade tortilla. Otherwise, these were a great stop along the journey. A great lunch, great company and a great visit. I will trek on. I will continue. Because as a Foodie, the journey never ends. No, as a Foodie, The Journey Continues.